I first picked up a rod over 20 years ago and became addicted to fly fishing in my early teens, fishing the small waters around Wales and Southern England, before progressing to the large still waters and rivers for Wild Brown Trout. I have travelled around the UK, fishing the crystal clear chalk streams of Southern England, to the Salmon rich rivers of Ireland. My love of the sport has taken me to the warm sea waters of Cuba, stalking tailing Bonefish in knee deep warm water without a cloud in the sky, where I’ve been lucky enough to land many game fish on a fly, such as Bonefish, Permit, Tarpon, GT’s, Jacks and Snapper all of which keep me going back. I am a proud and active member of GAIA (Game Angling Instructors Association) supporting them through Game Fairs where I provide tuition and hold the APGAI (Advanced Professional Game Angling Instructor) Qualification in both Trout and Salmon. 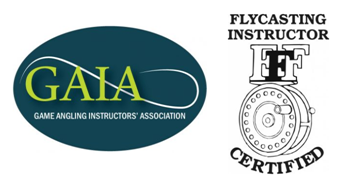 I am also a member of the American organisation the FFF (Federation Fly Fishing) where I am a qualified MCI (Master Casting Instructor) and THCI (Two Handed Casting Instructor). Passing on my knowledge of Fly Fishing through Guiding and teaching gives me great pleasure. I continuously develop my skills through CPPD Days to ensure I am always up to date on the latest techniques and styles. I am a recommended guide of the Wye and Usk Foundation. I teach a complete range of skills from traditional wets, drys & spider fishing, to the more modern Czech & French Nymphing. I am CRB Certified and Fully Insured.